19 years ago, a colleague and I began designing and programming a new animation system at Rhythm & Hues Studios. More engineers joined soon thereafter as the studio put its full weight behind getting voodoo up and running. 17 years ago, voodoo officially went into production. The first film I used it on was Mousehunt, where because of my insider's understanding of the tool I was tasked with rigging the CG mouse. 2 years ago, voodoo was used to produce was the Academy Award-winning Life of Pi. 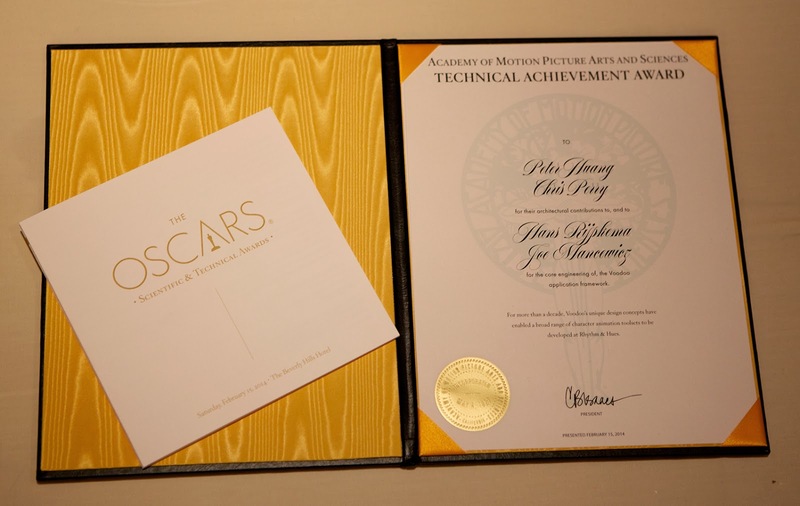 And last week, four of us received a Technical Achievement Award from the Academy of Motion Picture Arts and Sciences for our contributions to voodoo! Other than the UNIX command-line tools, I can't think of another piece of software that I use which is not only still kicking after 17 years but thriving. I mean, Richard Parker? That was some high-level business. Certainly a far cry from that little mouse. I wish I could take credit for the artistic successes and incredible longevity of voodoo, but I left R&H in 1997. Any impact I had was in the original design and in helping hire excellent people to take over after me! My fellow honorees and I had the chance on-stage last week to acknowledge all the artists and programmers who worked tirelessly with voodoo over so many years to make it what it has become. But I want to do so again here. I am simply awed by what they've done with it. And a note to you, 25-year old immersed deep in your own passions, doing something exciting and risky: you never know what's going to come of your explorations. This surprise award was from almost a half a lifetime ago. That's a long germination.